Cooking for a large family means that there are a few family dishes that are not someone’s favorite. I can think of a certain child who doesn’t care for rice and another one who doesn’t like eggs. Then there’s the guy who used to like Tuna Casserole but suddenly didn’t. There’s a replacement meal for those occasions. It’s called cereal. There are also certain foods or ingredients that only a few people like, so they don’t get cooked very often. Coconut is one ingredient. 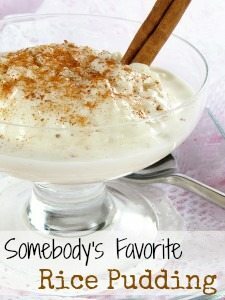 And Rice Pudding is one recipe. 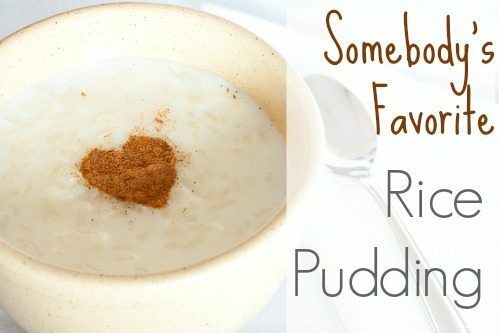 I personally like Rice Pudding, so fortunately the decision for cooking it rests with me. It’s good warm out of the oven and cold from the refrigerator. I like it with a bit of milk poured on top. Most of my family has feelings for Rice Pudding that match my husband’s feelings for Bread Pudding—just say no. Bring rice and water to a boil, then reduce heat, cover and simmer for 14 minutes, stirring lightly twice. Beat eggs slightly, add sugar, milk and vanilla. Put in baking dish. Set in pan of water and bake one hour at 350 degrees (this keeps the rice from getting crunchy on the bottom and keeps it creamy). Sprinkle with cinnamon. Serve plain or with milk or half-and-half. In Spain they add pieces of lemon peel as they are preparing this dish and pick them out after it is done cooking. It adds a lovely flavor.